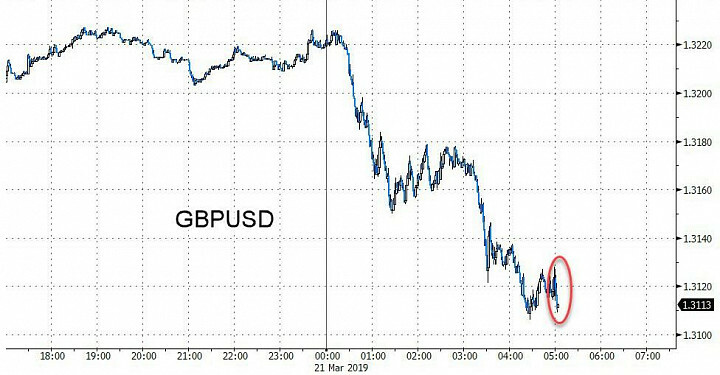 With just a week left until the "hard Brexit" deadline, it is not surprising that traders remain far more focused on the ongoing Brexit developments, where overnight skepticism about a lengthy Brexit extension returned - as Theresa May now appears to have lost all control of the process - pushing cable to session lows. As such, it is also not surprising that there was almost no market reaction to the Bank of England's decision this morning, which kept rates on hold while voicing more of the same concerns about Brexit's impact on the UK economy. As Bloomberg adds, the Bank of England said more companies had triggered plans for a no-deal Brexit as it kept policy in a holding pattern while the government takes withdrawal talks to the brink. Around two-thirds of firms surveyed by the central bank said they had started implementing contingencies for a disorderly departure from the European Union. About 80 percent judged themselves ready for such an outcome. 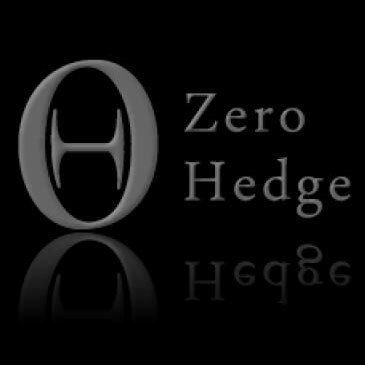 Of course, with Britain just days away from its scheduled departure date from the EU, what the BOE does today is largely irrelevant and will be subject to the consequences of the March 29 outcome, as the British relationship with the bloc is as unclear as ever. Prime Minister Theresa May has asked for a short extension of the timeline, but there’s still a risk that the U.K. could leave without a deal, which would threaten chaos in trade and a sharp drop in the pound. 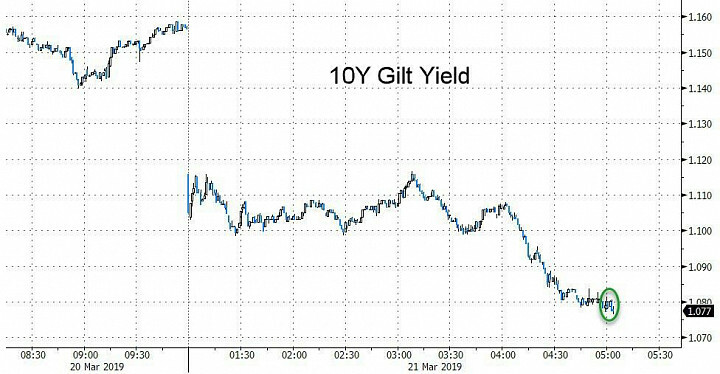 ... even as gilt yields continued to plumb 2 year lows, largely in response to yesterday's dovish Fed.